Bring back the nostalgia of the holiday season with this traditional 1-sided arrangement. 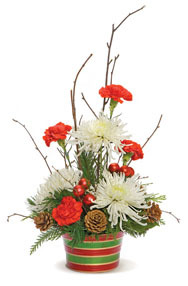 Designed with red and white flowers, it is sure to deliver Holiday cheer to any home or office. Exact container may vary.